Contact me. Risk something with me. Nicki Pombier Berger is an oral historian, educator, and interdisciplinary artist. Nicki is on the faculty at The New School College of Performing Arts, where she teaches in the Drama BFA program. She is the Founding Editor of Underwater New York, an arts project of creative work and programming inspired by the waterways of New York City. From May-October 2018, UNY is co-hosting a Water Art residency on Governors Island in partnership with Works on Water. Most recently, Underwater New York produced a sold-out run of A HELD POSTURE, a solo show by Hyung Seok Jeon, at Theaterlab (January 2018). In 2016, Underwater New York edited fiction and poetry for SILENT BEACHES, UNTOLD STORIES: NEW YORK CITY’S FORGOTTEN WATERFRONT, in collaboration with author Elizabeth Albert, published by Damiani (September 2016). Underwater New York has curated dozens of events in the five boroughs, has been featured in The New York Times among other outlets, and has published nearly 200 artists in its digital journal. As an oral historian, Nicki has created and curated multimedia exhibits online and in public spaces, and designed and produced educational and experimental films. Presently, she is an Artist Resident for DISCOVERING SELINSGROVE, a public history pilot, using an arts- and oral history-based approach to document first-person experiences of institutionalization, run by The Institute on Disabilities at Temple University and funded by the Pew Center for Arts and Heritage. From 2014-2015, she worked on A Fierce Kind of Love, The Institute on Disabilities at Temple’s multifaceted arts-based project on the intellectual disability rights movement in Pennsylvania, for which Nicki co-curated content for a multimedia exhibit online and in the rotunda of the Pennsylvania State Capitol and Philadelphia’s City Hall (Here. Stories from Selinsgrove Center and KenCrest Services). 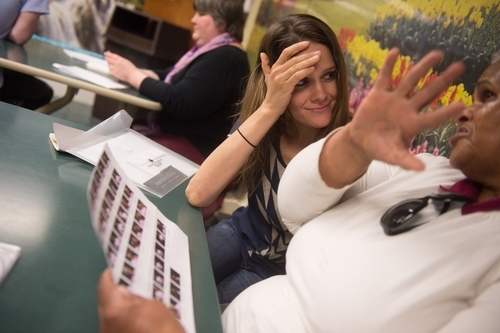 In 2015, she produced An Accidental Documentary, an experimental film drawing on personal and archival oral histories to teach a history of intellectual disability. From 2013-2104, she designed and produced the TILL Living Legacy Project, an educational film designed to engage human services staff in rethinking the complexity and humanity of people with intellectual disabilities, which won the 2015 Innovation Award from the Massachusetts Council of Human Service Providers. In 2013, she produced an online multimedia collection of stories from self-advocates with Down syndrome, “Nothing About Us Without Us.” From 2010-2013, she led several community engagement efforts at the national nonprofit organization, StoryCorps. From 2015-2017, she was a Research Fellow on the Robert Rauschenberg Oral History Project. In collaboration with playwright Suli Holum, she is currently working as dramaturg on THE BAKKEN, an investigation of the Bakken shale, a rock formation roughly 350 million years old sitting deep below the surface of North Dakota. 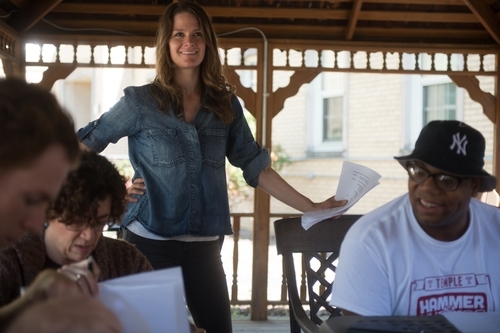 Nicki has taught at the New School College of Performing Arts in the Drama BFA program since 2015, and teaches oral history workshops regularly, for a wide range of audiences and purposes. Along with her collaborator Liza Zapol, she performs Push Play, an experimental workshop drawing on the tools and language of performance ethnography and theatre studies to enliven the practice of oral history as art. Nicki has a Master of Arts in Oral History from Columbia University (2013), a Master of Fine Arts in Writing from Sarah Lawrence College (2009), and a Bachelor of Science in the Foreign Service from Georgetown University (2001). She invites you to join her in Risk Listening, an oral history experiment.